Council woman Kim Gray, who represents North Central Richmond, sponsored the ordinance renaming Boulevard as Arthur Ashe Boulevard. With Virginia in the national spotlight over race and reconciliation, Richmond City Council voted on Monday to rename Boulevard after African American tennis star, AIDS activist and Richmond native Arthur Ashe. The council voted in favor of the proposal 8-0-1, with 8th District council member Reva Trammell abstaining. The City Council heard from more than three dozen supporters of the name change, including family and friends of Ashe. Jolynn Johnson Smith, the granddaughter of one of Ashe’s coaches, Robert W. Johnson, said she thought the time was right for this change given the recent revelations that Governor Ralph Northam and Attorney General Mark Herring appeared in blackface in 1980s. 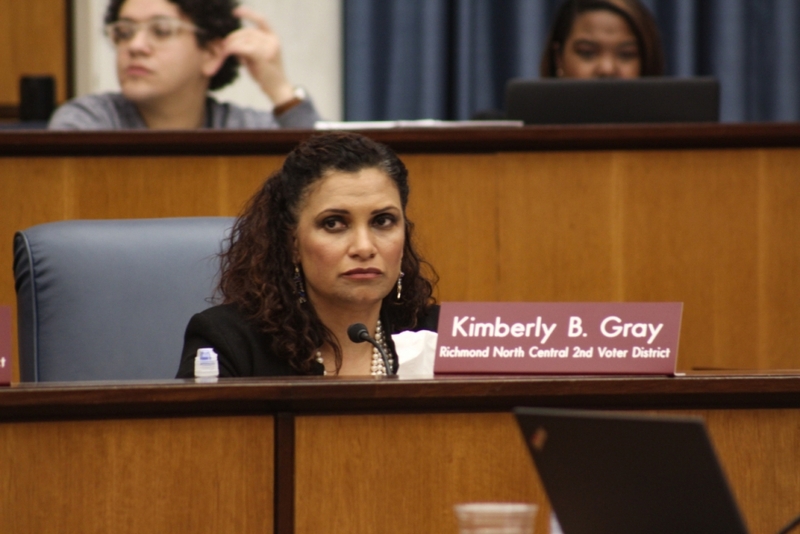 That sentiment was echoed by 2nd District council member Kim Gray, who sponsored the bill. Council members Parker Agelasto and Andreas Addison, whose districts both encompass parts of Boulevard, voted reluctantly in favor of the paper. Both expressed concerns about how the ordinance disregarded laws already on the books, which requires 51 percent of property owners on the Boulevard to sign off on the name change. Agelasto also questioned whether the city of Richmond would be on the hook for the full cost of new street and highway signage estimated to cost $330,000. He was not convinced by Gray’s assurances that the city would only pay $30,000 for street signs, with the Virginia Department of Transportation picking up the rest. About a dozen people spoke against the ordinance, asking council to delay the vote in order to have a larger community conversation around how to best honor Ashe. Many of the opponents also wanted to have the name change vetted by the city’s newly created History and Culture Commission. The ordinance was first introduced five months ago. Also of note: An affordable housing paper sponsored by 6th District council member Ellen Robertson passed. The ordinance requires that any developer who wants to build on city-owned land or who is seeking tax breaks from the city council must reserve 15 percent of the development for affordable housing.